Yesterday we celebrated my sweet baby Enzo’s 3rd birthday! Call us crazy, but we don’t have any human-kids and the furry ones have our hearts. Puppy birthdays mean a dollop of whipped cream on their kibble and some new accessories. 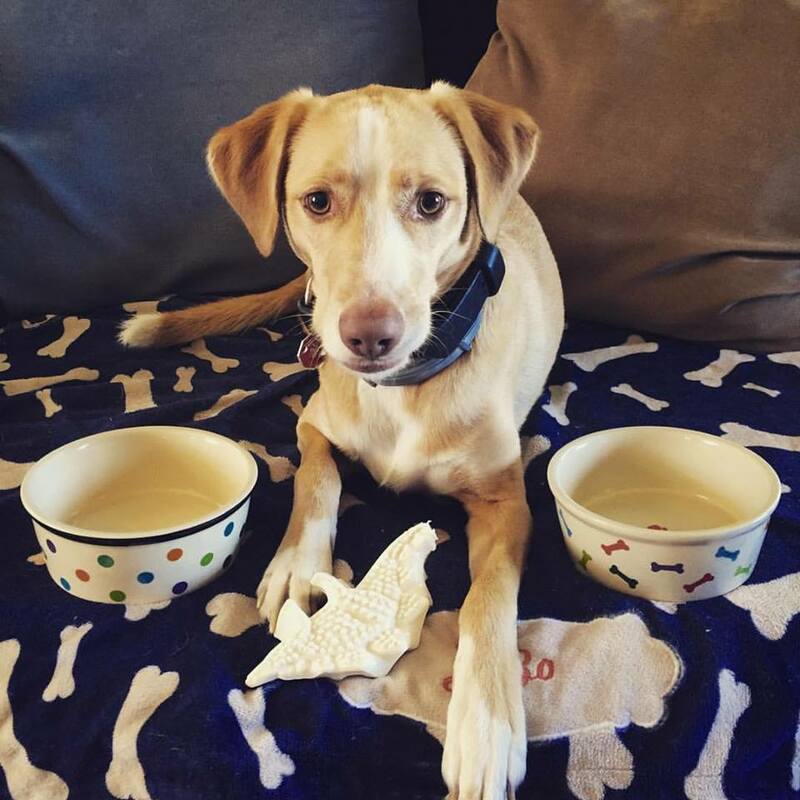 Now puppy brother has bowls to match Lylee (which she got for her b-day in June)! We go through Nylabones quickly so E got a new dinosaur (to share with his sis), too. I’m just about to wrap up Cress. I’ve been collecting the Lunar Chronicles as I’ve read them because I love them so much! I’d like to find a paperback copy of Winter, but it might not exist… Either way, these two books would complete my collection! We have a Keurig but I hate it. I just want a normal coffee pot that I can schedule ahead of time. Like this one. Or this one. I’m going to be honest here… I like my kitchen accessories colorful. I have a purple toaster and a red mixer- a black coffee pot just won’t do. This was on our wedding registry and I’ve been crying about not having one ever since. I’m not picky anymore. It needs to be big enough to make +6 pancakes and I’d like a drip tray. I’ve been browsing Amazon but haven’t found anything yet. I don’t want anything huge, but it needs to hold my mat cover, too. I’ve actually been eyeing up the bags in the boutique at my local studio (hint-hint, Kyle). I’ve heard that this movie isn’t great, but I love the X-Men franchise so I’m willing to overlook that. Actually, I don’t think I own one X-Men movie, so I’ll take any of ’em. Anything from these two talent artists! I love Julie’s art work and I’ll be needing some cozy accessories from Rebecca Jo before I know it! I think that about covers it… Ha! What have you had your eye on lately? Christmas is right around the corner! 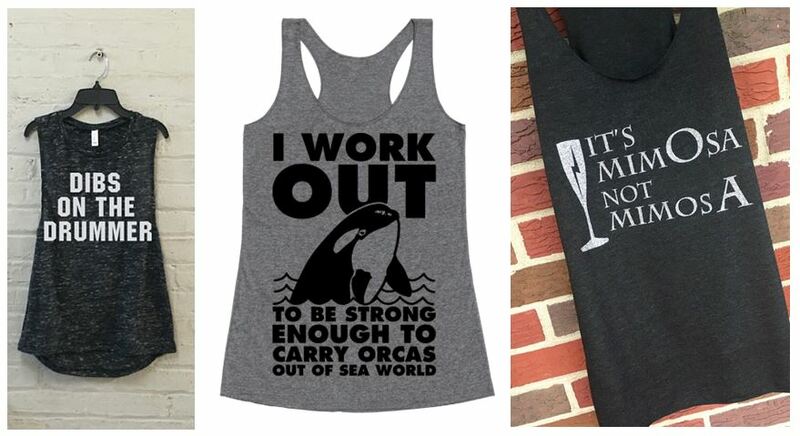 That sea world workout tank is EVERYTHING. Right?? I love it so much! Ricky just bought home the new X-men movie last night from Target. We’re trying to plan a night we can sit down & watch it. CANT WAIT!!!! Any excuse to put some whipped cream on the dog food!! They love it 🙂 I hope you enjoyed the movie- although I saw the pic where Harvey was trying to distract y’all! Haha! Don’t ever feel like you have to justify celebrating your pets just because you don’t have human kids. You treat them like family and always will and that makes you a very good person in my eyes. So happy birthday to you Enzo!! Cheers to many more, you little fluff nugget. My mom bought me nice fancy cookie sheets, totally worth the investment. Why do you hate keurig? I love mine! Of course you celebrate your furbabies birthdays! All good furparents do! Good cookie sheets make ALL the difference. When we got married we got good ones and I never burn cookies now! One of our pups has a birthday coming up this month too! And the other is in November, and mine’s in the middle. 🙂 That picture of Enzo is SO CUTE. Michael wants the illustrated HP books too. So far we have all the hard covers, three of the paperbacks (and want the rest…so we can read the paperbacks if/when we reread them again because I’m like BE CAREFUL WITH THE HARDCOVERS hahaha). And he started collecting those Funko Pop HP characters. At this rate we’re going to own everything HP-related. Hahaha. I have all the hardbacks but they’re at my parents’ house still (except #1). Happy soon-to-be birthday to your babies (and you)!! Happy Birthday Enzo!!!! Lunar Chronicles is on my list to read and I really need to get on that. Our bookstore at the mall had two of the books on sale for $6 but they weren’t in order or the first one so I didn’t pick them up. I may change my mind and go back for them. I don’t think I could live without my Keurig, I used to hate the regular pot with the coffee grind mess and all. You know you are an adult when half the items on your birthday wish list are for around the house. Happy Birthday month! Alllllllll the adult gifts. Hahaha. I take too much pride in my kitchen, though, so it makes sense. happy birthday to enzo! he’s so cute. Thank you! Currently he’s hoovering over my keyboard… ha. Good to know I’m not the only one who’s team coffee pot. Ha! Hey I have a red mixer too! Also, you don’t want cookie sheets, you want Pampered Chef’s baking stones. They are the absolute best ever, and I won’t cook cookies on a regular cookie sheet ever again. Mine are now reserved for putting on the rack below my pot pie in case it boils over. I originally wanted yellow but I got red and it matches my kitchen even better! Hmmm. I’ll have to look into those! I really thought the burnt things were my fault but after following recipes to a t we’ve decided it’s the cheap cookie sheets! Aw, happy birthday to you and Enzo! Our Bully will be turning nine at the end of the month and we’re going to celebrate with him! Thank you! Dog birthdays are so fun- I love spoiling the fur babies! My best friend has those mats, too, for her cookie sheets and loves them! I swear I’ve mentioned the Lunar Chronicles in every post these last few weeks. Ha. If I don’t get Winter next week I’m definitely going out and getting it 😉 Haha! Happy Birthday to Enzo! I LOVE that mimosa shirt. So hilarious. The illustrated version of Harry Potter looks so beautiful. I giggle every time I read that shirt! I’m so excited to read/flip through the new HP book! I asked for some “cozy accessories from Rebecca Jo” too for my birthday. I sent the link to my mom, told her exactly what I wanted. What did she do? She went to a department store and bought a scarf and head warmer. Yes, they are cute, and I am grateful, BUT, I wanted to support someone like Rebecca who makes the stuff herself and not a big department store chain. I hope you gave Enzo extra smooches for Enzo Day! Hahahaha, I think that’s something my mom would do. Probably my grandma, too. Lol. K is pretty good about buying from Etsy shops, especially when he knows that the seller is a blogger that I follow and talk about in real life. Ha! Alllllll the kisses for Enzo Bug ❤ !! Happy Birthday Enzo!! What a cutie! I never bother with my birthday, since it wouldn’t matter what I said, I just end up with a bunch of stuff I don’t need/want etc. Even when I am asked what I’d like, I say a few things, it’s pretty much guaranteed that I’d get something completely different like “I know you said you’d like that 34mm lens, but I bought you a new kitchen bin instead because I bought one for our kitchen and I liked it”…. I’m still hoping for a Kindle gift card this year though. That’s only a problem with family members outside of me and Kris. We tend not to buy gifts and just do something fun instead. K is pretty good at gift giving. He doesn’t always seem like he’s paying attention, but he usually is. I thought maybe a post like this would ensure some wanted gifts since lots of people that buy for me read it 😉 We will see…. Ha!